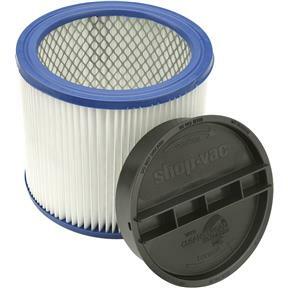 Special HEPA cartridge filter for both wet and dry pick-up. Maintains suction power even when used with fine debris like drywall dust! Resists clogging. Easy to clean, just tap or rinse. Reusable! One Year Satisfaction Guarantee! Exclusive Nonstick Surface. Fits full size vacs. Does not fit Hang Up Vacs, 5 Gallon Contractor Portable, Floormaster Plus, All Around Plus, Heavy Duty Portable, 1x1®, BullDog® Portable, Mighty Mini®, Mini Hangup, Hippo®, or All Arounds with 1-1/2 or 2 Gallon tank sizes. The ultimate HEPA filter for wet or dry pickup. Pickup cold fireplace ash, auto refinishing, cement dust, sawdust, drywall dust, plus water - plumbing emergencies, outdoor cleanup, wet basements, water leaks, and spills. Fits full size vacs. Super-efficient dry filters can trap 99.7% of lung damaging particles (over 0.3 microns). Easy Clean. This filter is for the Shop-Vac 610-50-10 and 601-04.